Oishii celebrated its 5th anniversary this year, and yet I’ve never presented my readers with a top 10 (or in this case 12 for ’12) post as a way to usher in the new year. Why? Perhaps I’m just not a jump-the-bandwagon type of person if it appears that everyone else is doing something. But this year, I get it. I realize that it’s a way to look back on the year and remember the good times and even the bad times through the lens of food and the people you shared it with. As we get ready to bid farewell to 2012 (we plan on staying in, eating cheese fondue, and playing Scrabble), I present to you YOUR favorite recipes from this year. Cheers, readers! I made these cupcakes for Levi’s 2nd birthday last spring. I’m not sure which one was more satisfying – the brown sugar cream cheese frosting or the look on Levi’s face when he got to lick the beater after I made it :). I don’t by any means consider myself an avid baker or cake decorator, so I was thrilled when I received such positive feedback on these tasty cupcakes. They were made with love for my little boy! They’re chewy, they’re hot off the grill, and their pockets can be filled with everything from scrambled eggs to falafel. Homemade pita bread was definitely one our favorite summer recipes and this recipe (originally from Fine Cooking) got lots of fan love. Three main ingredients – one incredible appetizer. These would be a great addition to a New Years Eve appetizer spread. We nostalgically refer to Tori no Karaage as “Japanese festival chicken,” because whether the occasion was cherry blossom-viewing in the spring or a hanabi (fireworks) show in the summer, we could always count on there being a fried chicken stand, and it was one of our comfort foods while living in Japan. 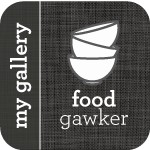 This post got lots of views this year thanks to Foodgawker. I was happy to see that the Sriracha Burger was in the top 10 in both 2011 and 2012. Let me break it down for you again: a buttery brioche bun, grilled grass-fed beef patty seasoned with Sriracha and soy sauce, bacon, caramelized onions, nutty swiss cheese, peppery arugula, tomato, and a secret sauce of tangy blue cheese dressing mixed with Sriracha. What? You haven’t made these yet? Get on it! Who knew that something Dustin threw together on a whim in response to one of my pregnancy cravings would be such a hit? This humble, comforting dish is very versatile – you can add whatever veggies and leftover cooked meat that you have on hand. We made these tacos for a summer recipe swap, and they were very well-received in the blogosphere. When grilling season rolls around again, you’ll love the charcoal flavor of the grilled shrimp, and the kick of Jalapeño in the zesty ranch sauce. These grilled portobello mushrooms stuffed with goat cheese, tomatoes and basil were our most popular vegetarian dish of the year. If you’re hungry for more stuffed portobellos, try Grilled Portobello Mushrooms with Goat Cheese and Olive-Caper-Pepper Relish or Portobello Mushrooms with Creamy Spinach-Artichoke Filling. We took our favorite baked mac and cheese recipe (courtesy of Alton Brown) and added chorizo to give it a little Mexican flair. Yum. Last winter we quadrupled (!!) this recipe, omitted the chorizo, and made it for 12+ extended family members who we were visiting down in southern California. My best friend and I made this shrimp in a spicy, smoky, chile-tomato sauce, inspired by a dish at our favorite Mexican restaurant. It was a hit this year in many of your homes as well. Another successful recipe-swap assignment, we loved these baked eggs in puff pastry with a little goat cheese & bacon surprise in the middle. This recipe was our most-pinned recipe in 2012 and I can understand why. Try these for your next brunch, or if you happen to be craving something breakfast-y for dinner. One of our simplest recipes made it to the #1 spot this year, which made me happy because I’m a firm believer that simple is almost always best (one of the reasons why I love Alice Waters and her whole philosophy on food). Just a quick marinade of olive oil, fresh chopped rosemary from the garden, garlic, salt, and pepper ready these pork loin chops for a sear in a hot skillet before finishing up in the oven. Hello, easy weeknight dinner! Well, there we have it, folks – your favorite Oishii recipes in 2012. Have a festive, delicious, safe new year and we’ll see you in 2013! A year of new beginnings!